We’d love your help. Let us know what’s wrong with this preview of The Simplicity of Cozy by Melissa Alvarez. Make cozy your way of life with this inspiring guide on connecting to the positive energy of simple, everyday moments. Known around the world as hygge (hoo-ga), lagom (lay-go-m), and other similar terms, cozy and balanced living helps you improve your health, happiness, and spirituality by understanding and feeling the frequency of people, animals, places, and situations. To ask other readers questions about The Simplicity of Cozy, please sign up. DNF, I'm afraid. After about 30%, I decided there was nothing new here for me. Many thanks to NetGalley, the author and publisher for providing me with an arc for my honest opinion. I received this book from NetGalley in exchange for a fair review. Rarely have I found a book that I cannot find something good to say about. But, this is one. Talking in circles, never actually making a point, trying instead to mystify the reader with buzzwords and mumbo-jumbo. Ano I received this book from NetGalley in exchange for a fair review. Another example, "as you sit there, purposefully imagine the positivity of white light moving though your frequency, your own personal vibration, the energy of all that you are". Yeah, okay. Maybe too much coffee? I honestly could not finish this book. Maybe somewhere after the first quarter of claptrap the author settles down and makes some sense? Perhaps, but I know I won't be finding out. I received a free e-book copy of this title from NetGalley in exchange for an honest review. I was given this ARC by the publisher in return for an honest review. The biggest difficulty I had with this book was the formatting of the file I was given; the entire text was just one big blob of words, starting with the publisher’s information. I kept flipping back and forth, trying to find the start of the actual book part. It was very confusing. The book itself begins with a description of the various ideas of “cozy” in different cultures, then it switches abruptly to an exercise for the rea I was given this ARC by the publisher in return for an honest review. The book itself begins with a description of the various ideas of “cozy” in different cultures, then it switches abruptly to an exercise for the reader to complete…on being cozy? I had no idea what was going on. Overall, this wasn’t really what I had expected from the description of the book. I must admit that most of my frustration stemmed from the formatting and sheer confusion it produced by not knowing what was going on and where I was with respect to the location in the book. What I did gather from the idea of being “cozy” is the fact that one simplifies certain aspects, as in organizes things in order to reduce clutter (mentally or physically) to achieve a state of comfort, which I did not get from this book. I cannot recommend it. Well.... this book was not at all what I thought it was going to be from the description. Mindfulness? I love books about that. Being comfortable in smaller spaces? I love that too. This book, not so much. This book was so frou frou. about "getting in touch with your spiritual self" and finding that bliss of being. The concept isn't awful, but the way it's presented sure was. Her "tips" for achieving this more often are blatantly obvious things like "schedule some me time", "wrap up in a blanket" Well.... this book was not at all what I thought it was going to be from the description. Mindfulness? I love books about that. Being comfortable in smaller spaces? I love that too. This book, not so much. This book was so frou frou. about "getting in touch with your spiritual self" and finding that bliss of being. The concept isn't awful, but the way it's presented sure was. Her "tips" for achieving this more often are blatantly obvious things like "schedule some me time", "wrap up in a blanket", or "light some candles". Cozy is one of my favorite words and feelings. I love the global focus of this book in exploring the emphasis and understanding of cozy around the world. It's very focused on your soul being attuned to the world around you, and a bit new age in that regard. Overall it feels like the author found what's trendy and used a bunch of buzzwords and common concepts to try and create a book about spirituality, but it feels disjointed and flat. The book started strong, but fell apart very quickly in my o Cozy is one of my favorite words and feelings. I love the global focus of this book in exploring the emphasis and understanding of cozy around the world. It's very focused on your soul being attuned to the world around you, and a bit new age in that regard. Overall it feels like the author found what's trendy and used a bunch of buzzwords and common concepts to try and create a book about spirituality, but it feels disjointed and flat. The book started strong, but fell apart very quickly in my opinion. I usually try to focus on the positive in my reviews, but I couldn't find much to like in this book. It's a mishmash of hygge and energy healing, with practices from other countries around the world tossed in with no seeming rhyme or reason. It seems to me that the author is mainly interested in energy healing and was trying to use the trend of hygge to sell it. Skip this one unless you're into energy healing—and maybe even if you are; this book's a bit of a mess! I wasn’t sure what to make if the book initially. I’ve been hearing all about “Hygge” for last year, and how it’s so incredibly life changing from some and total hogwash for others. I decided I would give this book a chance as it explored more than one version of “cozy”. The book started off a bit slow, and to be honest a bit too “hippie and love” for me. I gave it a chance and continued reading, and I fell in love with it. I’ve been following so many of these practices in my own life over the p I wasn’t sure what to make if the book initially. I’ve been hearing all about “Hygge” for last year, and how it’s so incredibly life changing from some and total hogwash for others. I decided I would give this book a chance as it explored more than one version of “cozy”. The book started off a bit slow, and to be honest a bit too “hippie and love” for me. I gave it a chance and continued reading, and I fell in love with it. I’ve been following so many of these practices in my own life over the past few years, slowly integrating the ideas, the book just reinforced what I've already believed. This book has so many great ideas and concepts, for someone looking to really just slow down and accept the “cozy” into their own life. It’s not just about decorations, candles, a warm blanket, or the environment. It really digs down into all areas of your life, which gives you a sense of how to fix those areas and truly incorporate the “cozy” energy into your life completely. I already know that I’ll be buying myself a copy, and one for my mother in-law for Mother’s Day this year. It’s an exceptional book with a very laid back energy too it. Reading it under a warm blanket in bed, with my dogs next to me, a hot cup of tea, the room lit with a scented candle and string lights over head only added to the cozy vibe. This is a nice little book on how you can incorporate a variety of practices to bring coziness into your life. If you read self-help books, you likely won't learn many new ideas, but you will appreciate how the author focuses on common practices with coziness in mind. I enjoyed learning how different cultures and countries embrace coziness (or similar concepts). Common themes include decluttering, mindfulness, nature, simplicity, connection, and spiritual practices. The chapter on coziness from an emotional perspective offers a fresh take on dealing with emotions and will encourage readers to be more mindful of how they engage with others. I was inspired to do a little decluttering and rearranging in my home and schedule to make my days cozier. It wasn't earth-shattering, but it did offer some much-needed energetic and physical breathing space. One of the first books I've read about the spirituality of simplicity. Melissa is a great author who walks us through words and states in various cultures such as hygge, lagom and many more to help us find our own unique ways to add coziness to our lives. Coziness is a way of life for many people around the world. It is a frequency connection at a very personal level that can bring about miraculous transformations at your core spiritual essence. It's about making internal and external soulful co One of the first books I've read about the spirituality of simplicity. Melissa is a great author who walks us through words and states in various cultures such as hygge, lagom and many more to help us find our own unique ways to add coziness to our lives. Coziness is a way of life for many people around the world. It is a frequency connection at a very personal level that can bring about miraculous transformations at your core spiritual essence. It's about making internal and external soulful connections. I actually had great fun reading this book slowly and taking it to coffee shops or meals as my own way of savoring the cozy moments. I really enjoyed reading this book. It starts out by listing all of the various words with a meaning similar to the word 'cozy', originating from predominantly Nordic European countries. It then wanders off a little bit to talk about things such as the importance of living in an organized environment, how to connect with your higher self (side note: this book was way mire spiritual than you would guess by the title or cover), mindfulness and other things. I think it is a good book if you go into I really enjoyed reading this book. It starts out by listing all of the various words with a meaning similar to the word 'cozy', originating from predominantly Nordic European countries. It then wanders off a little bit to talk about things such as the importance of living in an organized environment, how to connect with your higher self (side note: this book was way mire spiritual than you would guess by the title or cover), mindfulness and other things. I think it is a good book if you go into it knowing what it is about (ie. Not thinking it is another book about Hygge or Lagom etc.). I got to read an early e book edition from NetGalley. The version of the book I saw has no pictures. There is a lot of information about Hygge and other similar concepts in this book but I always appreciate some colorful pictures in a book like this. This book focuses a lot on a New Age side to Hygge and Hygge-like concepts. It’s a lot about focusing inward rather than on environment. That’s a neutral comment not a negative one. What you like in a book of this style could be different than what I I got to read an early e book edition from NetGalley. The version of the book I saw has no pictures. There is a lot of information about Hygge and other similar concepts in this book but I always appreciate some colorful pictures in a book like this. That’s a neutral comment not a negative one. What you like in a book of this style could be different than what I like. This book reminds me of a super long wishy-washy lifestyle magazine article. I can't quite put my finger on why it never gelled together but between having a unique take on the definition of cozy, using the cozy catch all less and less and then almost as a afterthought in much of the book, and never really completing a thought initiative, it just didn't work out. It feels like it might lean too much on the author's other works. It also went a bit too far in the "woo woo" direction for me. Lets be clear, this is not a picture book. this is a sit down with a cup of tea and blanket book. if you are looking for a book that has all the Instagram glossy photos look elsewhere; there are many of them on the market. However, this book is wonderful, in that it helps explain why slowing down and enjoying the little things in a simple way is so important to do, how it helps us and how we can do it. There wasn’t anything really new that I hadn’t read before, but I’m still glad I read it for the reminder of things that tend to get pushed aside during our busy lives. I have enjoyed learning more about hygge this past year and this book seems it wanted to capitalize on that trend in hygge interest while adding more of a spiritual component than other books on the topic. I received this book as an advanced read from NetGalley in exchange for a fair review. When experiencing stress, we often overlook life's simplest pleasures, forgetting to pause, and simply, breathe. 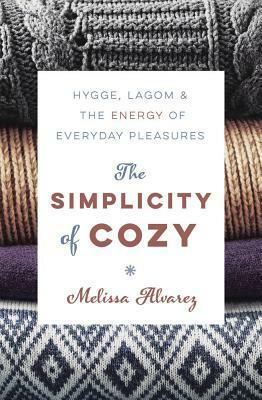 In Melissa Alvarez's The Simplicity of Cozy: Hygge, Lagom, and the Energy of Everyday Pleasures, the author demonstrates how shifting our energies to life's simplest pleasures and embracing coziness can result in a transformative spiritual growth. In describing this transformation, Alvarez takes us o I received this book as an advanced read from NetGalley in exchange for a fair review. This is a non-fiction (not my normal read) but I love the title & the ideas & help this book gives really makes me want to live more Hygge! The book gives good practices & suggestions on how to make your life more cozy, and simple. I can not wait to put some of the practices & tips into my own life. This book tries to cover every type of calmness strategy from mindfulness to yoga to dance. What it ends up doing is just having a few paragraphs on each topic with no real depth to any of it. Kind of a dispappointment. I came across The Simplicity of Cozy and had the pleasure of being able to read it. This book is a fountain of knowledge. I truly enjoyed not only expanding my own personal growth but learning more about the history of Hygge. This book will help you find other ways to experience your own version of "Cozy". I was able to explore the different meaning of hygge/cozy through different countries, the history was fascinating and well detailed. I felt like I had a better understanding after finishing t I came across The Simplicity of Cozy and had the pleasure of being able to read it. This book is a fountain of knowledge. I truly enjoyed not only expanding my own personal growth but learning more about the history of Hygge. This book will help you find other ways to experience your own version of "Cozy". I was able to explore the different meaning of hygge/cozy through different countries, the history was fascinating and well detailed. I felt like I had a better understanding after finishing the book. I do plan to revisit the book through the year and more than likely throughout my life. The book contained exercises to help you connect with your own spiritual self. Melissa Alvarez is a professional intuitive coach, energy worker, spiritual advisor, medium. 'The simplicity of the cozy' is a beginner's guide to self-care, an inspiring guide, in helping us to be happy for every little moment we live. All of our life should movingaround the concpt of 'cozy', that means find appreciation in every little moments, in every experience. I like the first part, in which the author gives us an overview of the various cultural terms, most of them northern european, that moving around the 'cozy' concept.